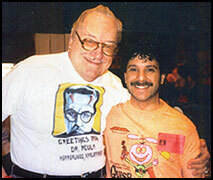 The Amazing Forrest J. Ackerman. I wish Forry Ackerman was my uncle!! Could you imagine going over to your uncle's house and he has the Robot Maria standing in the living room! This robot from the silent classic "Metropolis" is also called "Ultima Futura Automoton", and it is one of the wonders to be seen at Mr. Ackerman's house of movie curiosities. My single encounter with Forry aside from the photo-op pictured here was at the 1974-75 Famous Monsters Convention held in the N.Y.C. at the old (now demolished) Commodore Hotel. It was there that Forry told me that his friend Ray Harryhausen was scouting locations for a film called "Sinbad and the Eye of the Tiger". Needless to say I was thrilled!! Forry had been collecting the history of horror, science fiction and fantasy film for a damn long time - maybe even 60 blessed years. The original head from the "Creature From The Black Lagoon", the arm from "The Thing From Another World", the original Kong models (although now Peter Jackson owns them) including the Pteranodon that arrived on Forry's doorstep and for years everyone thought was a real dead crow! All these were his and a visitor to Forry's house was treated like film royalty. Never was there such a dreamer or a more sincere person. When Forry passes away he is leaving much of his collection I hear, to a museum in Germany. Wish it were my museum, but that's my dream and with my daughter as tour guide, Forry's fantasy collection would live on forever. Happy Birthday wishes to Forry Ackerman from all his friends here on the east coast!